There's a parking lot in Hollywood where Ecto-1 from Ghostbusters mingles with the Mercedes from The Hangover. Terrence Russell found the gems in the rows of taxis at Cinema Vehicle Services for Underwire. —Ed. Nestled away in North Hollywood is one of the most valuable parking lots in the world. The 100,000-square-foot complex houses the offices (and rides) of movie vehicle designer Tim "Fireball" Lawrence, as well as Cinema Vehicles Services - one of the most storied automotive build houses in Hollywood. "They say Nicholas Cage was the star of Gone in 60 Seconds," Fireball says as he walks through a body shop buzzing with activity. "He wasn't. The '67 Shelby Mustang we built here was the real star." Everything from Batmobiles to crashable "Ferraris" to an endless fleet of made-for-the-screen taxis and police cars have found life in this shop, thanks to Fireball's designs and CVS' team of automotive experts. Fireball gave Wired.com a look behind the lot's razor-wired walls, shedding light on the genesis, customization and final resting places of some of film and television's most memorable vehicles. Cinema Vehicles Services graphics guru Rick Carmody serves as mission control for all decal orders coming into the shop. Though a film's production designer typically hands over ready-to-use graphics, Carmody occasionally researches and creates the images from scratch. "Depending on the level of work, it can take about a half-hour to build something from scratch," says Carmody. CVS' graphics department keeps a small array of industrial printers tirelessly pumping out decals and other imagery. With police-car decals like the one above, the goal is to create an image that appears natural on the screen while also looking different enough to prevent real-life police-car mix-ups. "A lot of the times, we just tweak the insignia and quote," explains CVS' Tim "Fireball" Lawrence. "Instead of 'Protect and Serve,' it'll say something like 'Serving to Protect.'" The Ghostbusters' signature ride hides out in a quiet corner of the Cinema Vehicles Services body shop. Long after the second film wrapped, the original Ecto-1s were stripped and left to collect dust in various collector junkyards. Eventually, Tim "Fireball" Lawrence and the CVS team rediscovered them and started the restoration process. "We ended up passing them off to Sony for touring purposes, while they were mulling over greenlighting the third film," says Fireball. Now that filming for Ghostbusters 3 is ramping up, fans can expect to see the Ecto back on the big screen in 2012. These gutted 1967 Shelby GT500 Ford Mustangs are just two of the 11 that were built on the lot for 2000 action film Gone in 60 Seconds. "These two were what we called the 'Go Baby Go' cars," says Tim "Fireball" Lawrence. "They were specifically outfitted with the 'Go Baby Go' shifter knobs and nitrous rigs for that close-up shot." For every pristine car on the Cinema Vehicles Services lot, there are dozens of weathered and retooled stunt cars. "Cars will get rigged here for camera mounts, or things that have to get prepped for stunts, like beefed-up suspension," says Tim "Fireball" Lawrence. "If they're going to do 360s, then we'll put in a second emergency brake, too." Tim "Fireball" Lawrence's Corvette limo from Mystery Men sits sandwiched between a fleet of buses and service vehicles at Cinema Vehicles Services. "It seems sad with all the dust and grime, but it's really not," says Fireball. "A couple production designers could request this for a Coke commercial next week, and we'll have it rebuilt and painted red in no time. I get to have all the fun being the conceptualist." In addition to requesting cars for "hero" or stunt-driving purposes, studios source cars expressly with destruction in mind. Vehicles like this Ford F-150 will leave the lot in perfect condition and return with battle damage like these bullet holes. "Generally, they want to film the bullet holes hitting, so the special-effects guys will handle it all on-set," explains Tim "Fireball" Lawrence. "We just work on repairing the aftermath." The ominously titled Graveyard is where Cinema Vehicles Services' truly thrashed automobiles find cinematic life after death. "A lot of these cars won't drive, but they still get sourced quite often for post-apocalyptic movies," says Fireball. One of the most uncanny things about the Cinema Vehicles Services lot is the number of oddities hidden in plain sight. This covered behemoth (center) parked outside the business offices is the custom-designed, mini-gun-sporting, henchman-killing monster truck from Tango & Cash. Though the vehicle has seen better days, the motors on the mini-gun are still fully operational. Special projects and novelty items, like these statue molds for the Oscars award show, are sequestered in the lockdown section of the Cinema Vehicles Services shop. The area is reserved for items that need to remain untouched while a current show or film is in production. As for the story behind the Oscar molds? "The guy who owns this building also owns the molds," says Tim "Fireball" Lawrence. "He keeps them here for safekeeping in between Oscar ceremonies." This 650-horsepower Mini was built for the Speed Channel's Street Tuner Challenge. To create this nitrous-juiced beast, Tim "Fireball" Lawrence's team put in $250,000 worth of work and called in a favor from a Northrop Grumman designer to install a roof fin made of F-117 parts. For "character cars" like this, Fireball spends just as much time on the vehicle's back story as he does under the hood. "The idea was that this would be some sort of special-ops vehicle," he says. "It'd race into a combat zone and then release a little remote-controlled vehicle that sends out a sonic shock wave capable of destroying a city block." Kenny Powers' (aka Eastbound & Down's Danny McBride) souped-up purple Jet Ski is yet another resident of Cinema Vehicles Services' lockdown lot. In addition to keeping vehicles out of the elements and camera-ready, the lockdown provides a quick exit out of the sprawling complex. Otherwise, some of the less-accessible vehicles can take upwards of two hours to get out of the lot and ready for transport. When Cinema Vehicles Services builders aren't busy working on character cars, they're cranking out utilitarian projects like this gutted limousine. Known in the industry as a "buck," this half-vehicle is used for interior shots that take place in front of a green screen. Grips for rocking the chassis are welded on, to help the production crew complete the illusion of a car in motion. An original, '70s-era General Lee, at left, plays coy in one of the numerous Cinema Vehicles Services showrooms. "Since it was actually used on The Dukes of Hazzard, it's easily a million-dollar car," says CVS' Tim "Fireball" Lawrence. As to whether he actually designed it: "You know, I get that question a lot," Fireball says. "I usually just remind people that they used stock Dodge Chargers for filming, and I was something like 11 years old when the show was originally on." Sometimes the fakeness of Hollywood pays off. Using stunt cars like this "Fiero-arri" - a Pontiac Fiero dressed up like a Ferrari - is significantly cheaper than having a stunt crew destroy the real deal. Being able to customize virtually any vehicle calls for a lot of spare parts. 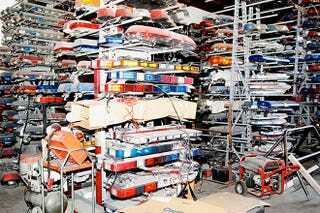 These racks of lights are just a small part of the Cinema Vehicles Services inventory that's needed to ensure the right fit, and a look that matches the right era, for on-screen automobiles. An ambulance undergoes a costume change in one of Cinema Vehicles Services' three painting bays. Because of the sheer size of the painting facilities - the biggest bay can house a big-rig truck - actual emergency-services departments contract the shop to handle their fleet paint jobs and decals. It's not always about building outlandish, scene-stealing rides at Cinema Vehicles Services. Tim "Fireball" Lawrence shares his personal philosophy about the cars that underscore the action, like this 1969 Mercedes-Benz Cabriolet from The Hangover: "The unique thing about a movie car is that everybody associates an experience to that vehicle, you know? Where they were when they saw Back to the Future, what their life was like when Dukes of Hazzard came out, watching The Hangover with buddies." There's a reason so much of the Cinema Vehicles Services lot is devoted to taxis and police cars. Tim "Fireball" Lawrence offers the most pragmatic explanation: "If you think about all the police procedurals on television now, and then consider all the times you see FBI or CIA cars pull up in films, it makes complete sense for these guys to rent them out."